This is not the first time Shahrukh’s home Mannat is in headlines. Mannat – one of the ten best bungalows in Mumbai city situated in the bustling suburb – Bandra, overlooking the blue Arabian sea. The building is so grand that it comes under the Protected Structure Act. The bungalow although has been a continuous site for problems in SRK’s life. it started when Shahrukh acquired the place. Mumbai NGO Bhrashtachar Nirmoolan Sanghatan, claimed Shahrukh had violated and encroached upon public space , filled a allegation. The first allegation against the actor is that the boundary wall adjacent to the road had been extended by 3 meters, causing the road width to come down from 9.15 meters to 6.15 meters. According to the PIL, construction should start a minimum of 1.5 meters away from the boundary wall but the petitioners claim the multistoried building has balconies that extend 1.5 meters outside the wall. 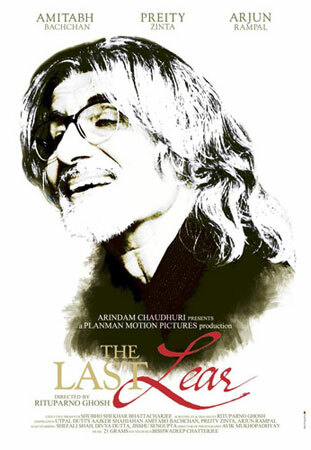 Amitabh Bachchan’s The Last Lear premiered at the 2007 Toronto International Film Festival on September 9. The film will also be showcased at the London Film Festival.? The film was received positively by critics with many saying that Bachchan has given a career best performance. The film is based on Utpal Dutt?s play and has an impressive starcast which includes Amitabh Bachchan, Arjun Rampal and Preity Zinta. Amitabh Bachchan plays a veteran Shakesperean actor called Harish Mishra, Preity Zinta is plays the role of a bad actor named Shabnam, and Arjun Rampal plays the role of their film director Siddharth. Big B is suppose to have given a path breaking performance in the movie. He has also penned a few Hindi dialogues for the film. The film falls under the genre of Indian, English films.